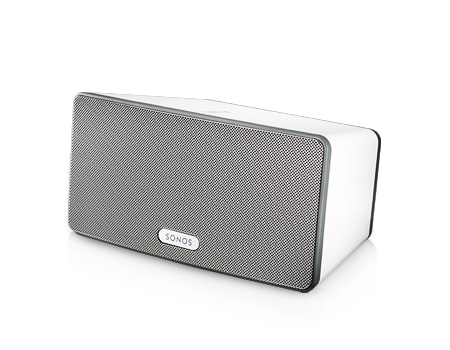 The Sonos PLAY:3 Wireless HiFi Player uses three internal amps to create an all-encompassing music experience. Pair it with the Sonos app for more fun. Want genuine, hi-fi sound in any room of your home? This all-in-one system lets you stream all the music on earth and wirelessly control it with your Android® device or iPhone® or iPad®. Available in white or black. Simply connect to a router to listen in any room of the house. Search, browse, and play with the free Sonos Controller app for Android, iPad, iPhone, Mac®, or PC. Wirelessly play your favorite online music services, 100,000+ free Internet radio stations, podcasts, and shows, plus your entire iTunes® library. With Sonos, it’s easy to bring music everywhere in your home. With just one touch, you can add as many Sonos players as you wish. No wiring. No programming. Play different songs in every room or blast the same song everywhere in perfect party sync.